The Chinese market, being one of the largest markets in the world, is an incredibly profitable market and it’s simply awash in QR Codes. QR Codes may have arrived a bit late to China, but no country has done more to incorporate QR Code usage into its everyday life and industries. The Chinese, who are already known for mobile internet preference, have adopted QR Code scanning with enthusiasm and many have even begun to use personalized QR Codes on their various social networks. With the QR Code’s popularity growing every year, Chinese internet giants are recognizing its potential for revolutionizing the market and have begun to integrate codes into their services. Tencent, a popular media, internet and advertising company, has launched its social app WeChat which includes a QR Code scanner, as well as an option to share QR Codes and redirect users to its Yingyongbao app store. In addition, Tencent’s online payment unit, known as Caifutong, has turned to QR Codes as part of their attempt to branch out into the lucrative e-commerce domain, with the hope of replacing credit cards someday. Alibaba Group, the internationally-known internet and e-commerce titan, has launched Alipay, their online payment solution, which is based on QR Codes as well. Moreover, Alibaba has teamed up with the Chinese media in an effort to publish QR Codes in newspapers which readers can scan to purchase items via Alibaba’s famous shopping site Taobao. 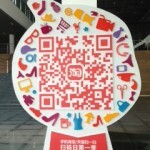 Here’s an example of Alibaba’s QR Code enterprise – going for bigger, better and more colorful codes. Search engine Baidu Inc. has cornered the app download market with more than 41% of app downloads going through their distribution channels. Baidu Inc. uses QR Codes to help link downloads to distribution source. This is another example of how QR Codes have become incredibly popular with China’s large industry of 3rd party app distributers, as they’re the best O2O solution for scoring quick downloads from users. In short, it seems that China’s biggest companies see QR Codes as a great way to offer their customers an easier way to shop, download and engage with businesses – and it seems that consumers in China are eager to respond, causing QR Code scanning percentages to rise each year. The competition for novel QR Code campaigns is also on the rise, giving birth to larger, more colorful QR Codes that are meant to draw more attention from passersby. Wait till they see what Shijuema (Visualead’s brand in China) has to offer them!